Sometimes parents have to explain things to their kids in more child-friendly terms. 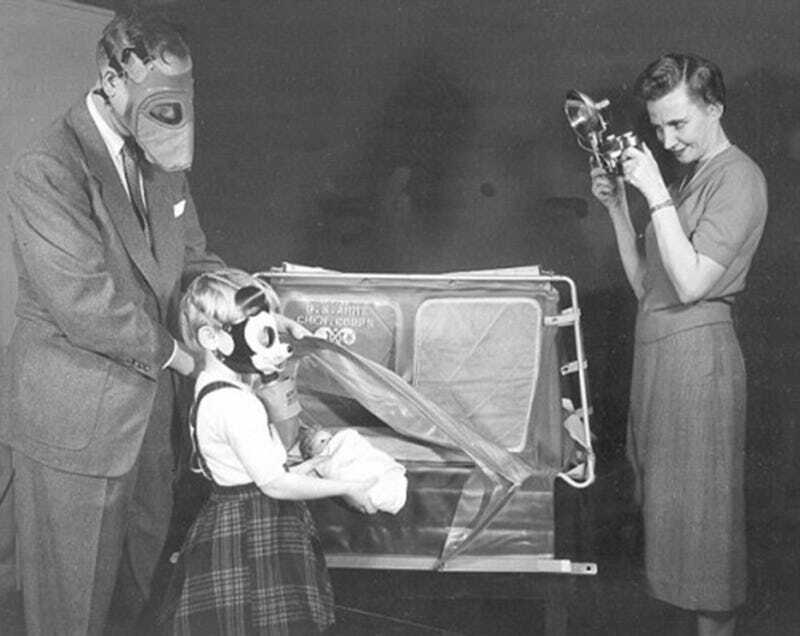 During World War II, that meant outfitting a child with a weird Mickey Mouse gas mask. It was 1942, just about a month after the Japanese bombed Pearl Harbor. Fearing imminent chemical attack on American soil, the government issued thousands of gas mask to civilians. But the smallest citizens couldn't fit into the regulation-sized masks. They were too heavy and too big. Plus, aren't those things scary? Well, while the Mickey Mouse mask might have soothed children, it was possibly scarier for mom and dad. Designed to fit kids 18 months to four years old, the mask was supposed to be worn as a sort of game, to take away some of the fear out of a chemical attack. Although, the masks probably weren't supposed to be so freaky. Sure, a child might be safer. But a mother might look at her toddler and think the real enemy was not the Axis powers across the ocean, but the tiny human with the head of a cartoon mouse with a perma-grin sitting in her lap. Anyway, with Disney's approval, Sun Rubber Company produced 1,000 of these strange masks in 1942. In 1944, it actually won the Army-Navy E for Excellence for producing them. Sun was supposed to make other versions of the pint-sized mask featuring other cartoon characters later on, but for whatever reason never did.